Artwork by O. Panchenko dedicated to the revival of the traditions of the Kuban Cossacks or Kubanians, who live in the Kuban region of Russia. Printed by the Colour Printing Plant, St Petersburg, 1994. This pack of cards appeared on the initiative of the publishing house “Bakay” situated in the Cossacks’ village Kanevskaya of the Krasnodar Territory. 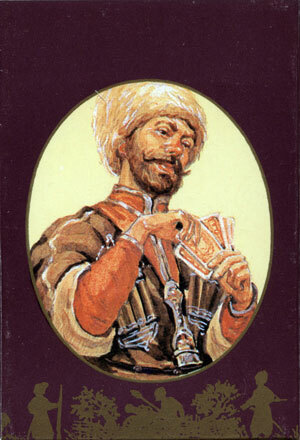 Above: “Cossack” playing cards, with artwork by O. Panchenko dedicated to the revival of the traditions of the Cossacks. Printed by the Colour Printing Plant, St Petersburg, 1994. All images courtesy Valentin Krasavin. The creation of this pack of cards occurred on the tide of the rebirth of Cossack traditions. The author of the “Cossacks’ Kuban” Oleg Panchenko depicted vivid types of Kuban Cossacks of the Caucasian war period on the face cards. The kings and jacks depicted as Cossacks clad in traditional Circassian coats of different colours, satin oriental quilted coats (beshmets) and tall Astrakhan hats seem to have gathered for the meeting before a long military campaign. The old Cossacks are thoughtful as if remembering old battles and the fallen. On the contrary, the young Cossacks are quite cheery as they dream about deserving crosses for their brave raids valiantly twisting moustaches to attract young Cossack girls’ attention. The young ladies with downcast eyes taking a sneak peek with sorrow realize that not all of these courageous Cossacks will return home. 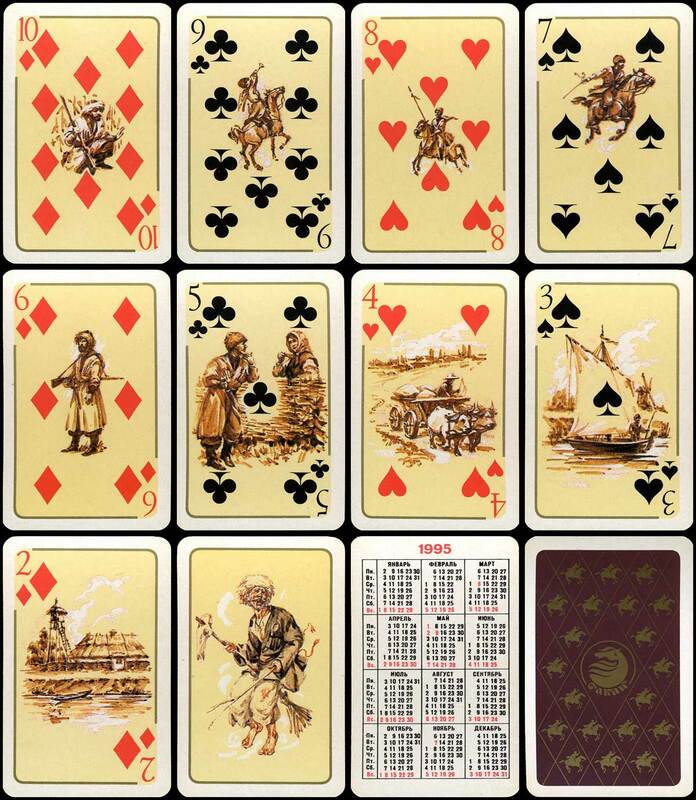 The pip cards are also dedicated to Cossacks’ life: scenes from everyday life in villages and dangerous days of war. The aces illustrate dear to the heart of any Cossack saddles, whips and sabres. Notes by E.Grigorenko.